A guide to balancing traditional collection issues with electronic access and document delivery demands, Collection Development: Access in the Virtual Library helps librarians find solutions and approaches for dealing with changes occurring in interlibrary loan, regional consortia, commercial vendor relations, and ownership versus access. Its sophisticated analyses offer you clarity of vision, the wisdom of experience, and solid advice as you are transported into the `virtual library environment’with its variety of expectations, service complexities, and information technologies. 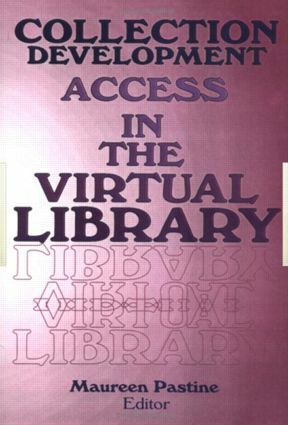 Still not convinced that this is the book you need to improve access in your library? Think again! Collection Development will help you with library control and ordering articles via commercial document delivery; it will help you develop coherent and intuitive ways of organizing and presenting available electronic resources; it will help you work with administrators and funding agents to attain a balance between traditional library resources and emerging information technologies, and much, much more!